Ram Sethu is a continuous stretch of limestone shoals that runs from Pamban Island near Rameshwaram in India to Mannar Island off the northern coast of Sri Lanka. 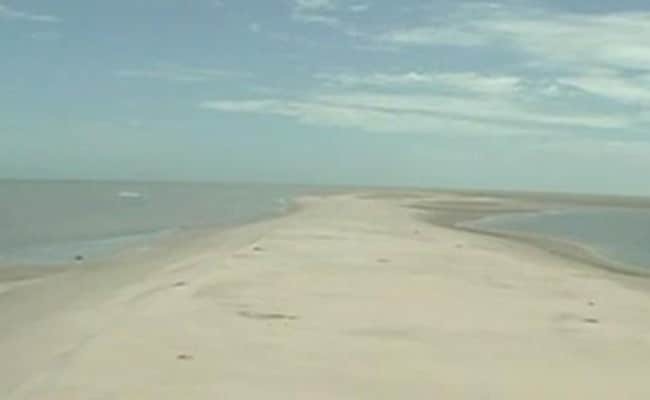 New Delhi: "Ram Sethu", the mythical bridge connecting India and Sri Lanka, will not be drilled or damaged "in the interests of the nation", the centre today told the Supreme Court. The government will, instead, look for alternative routes to implement the Sethusamudram Canal Project - a shipping channel between India and Lanka. "That the government of India intends to explore an alternative to the earlier alignment of Sethusamudram Ship Channel project without affecting/damaging the Adam's Bridge/Ram Sethu in the interest of the nation," the Union Ministry of Shipping informed the court in an affidavit. The Supreme Court, in November last year, had granted time to the centre to spell out whether it has taken a stand to cut through Ram Sethu for the Sethusamudram project. It is the belief of millions of Hindus that the Ram Sethu was built by Lord Ram with help from an army of monkeys, to rescue his wife Sita from the demon king Ravana, described in the epic Ramayana. The Ram Sethu or Adam's Bridge is a continuous stretch of limestone shoals that runs from Pamban Island near Rameshwaram in South India to Mannar Island off the northern coast of Sri Lanka. These marine structures, between the coasts of Tamil Nadu and Sri Lanka, have been at the centre of controversy especially since the Sethusamudram shipping canal project. Under the Sethusamudram project, a 83-km-long deep water channel would have been created linking Mannar with Palk Strait by extensive dredging and removal of the limestone shoals which constitute the Sethu. In December last year, a US Science channel ran a show ""Ancient Land Bridge", claiming the 'Ram Sethu" structure is not natural but man-made, citing images from a NASA satellite. The Science Channel quoted studies and scientists from Indiana University Northwest, University of Colorado Boulder, and Southern Oregon University. After the trailer of the show went viral in India, Union Minister Ravi Shankar Prasad tore into the previous Congress-led UPA government for its stand. In 2007, then union minister Kapil Sibal of the Congress had said that there is no scientific evidence to prove the Ram Sethu is manmade but argued that people's faith should be respected. This was the government's submission in the Supreme Court, which was hearing a petition against a project to set up a shipping channel between India and Lanka. Amid protests, the Congress-led government had withdrawn its affidavit in court.